Solas: "Survive the first thirty heartbeats, and you'll already have won." Did you ever try to go to Narnia? I did. Even in college, I never met a closet or wardrobe I didn't surreptitiously check for magical lands. And even before that, I'd always diligently explored any and all new ways to get to Middle Earth. 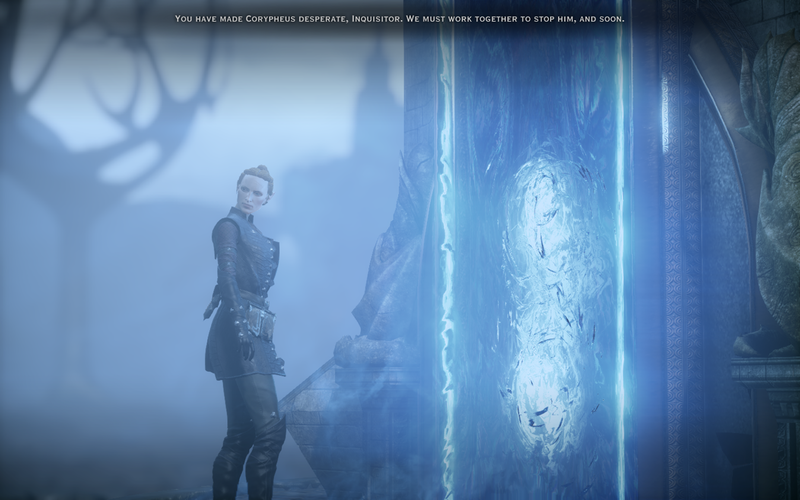 Eluvians are magical portals in the Dragon Age world. If I'd found one in the sixth grade? Or seventh? Eighth? Yeah. You wouldn't be reading this. Which existed, by the way. I knew this in my soul. Especially when it came to Tolkien's world. Even by 13, I'd tried and tried to find passage in every way I could. The certainty of his world felt like a knowledge thrumming just under my skin, a realization that magic in fact existed in the world, hidden only for the very most worthy. I couldn't give it up. The right combination, of course, would prove me vindicated. Unfortunately, the world happened. And adulthood. And all the predictable yucky stuff. And ultimately, I realized, oh, right. This was what being a grownup was like. When you stopped looking into closets for Narnia. When the dawning awareness hit you that maybe you should stop elven calligraphy or Tolkien linguistics or Lewis research or just generally Doing That... if you ever truly wanted to succeed in life. Mind you, I hadn't realized. I'd grown up an outcast. I'd been born with cerebral palsy and was a misfit who spent elementary school days wrapped in leg braces, corrective shoes, loneliness, occasional poverty, and the absolute best air of outward uncaring I could possibly manufacture. Inside, I was dying for connection. Outside, I was the human equivalent of a side-eye and a chilly shrug. People who attempted to connect with me were, ironically, most apt to be on the receiving end of a sarcastic quip and a dismissive glance. Hugs were not encouraged. I trusted few. My castle had to stay strong. Further complicating my situation, from first to fourth grade, I had a series of eye surgeries that included a full year of wearing a real, actual, incredibly ugly and flesh-colored eyepatch to school. The eyepatch got sweaty in summer and the string made an indentation in my already terrible bowl-haircut hairline. Being a nerd is only lonely on this side of the PC. It's the foundation of all RPG games and fandoms. It was hopeless. Even apart from the eyepatch, I was skinny when it was unfashionable and then fat when it was worse. I had straight mousy blond-brown hair that home perms did nothing to improve. I also had the worst buck teeth you've ever seen. The photo cube picture from my twelfth year (complete with Brownie Uniform and proud salute) is enough to make you weep. In the big-picture sense, I was incredibly lucky overall—all of this was part of an incredibly mild case of CP (the brain damage I'd suffered at birth had been so much less severe than it might have been), and I valued and recognized that luck constantly. However, I still hated myself every waking minute. I looked funny. Walked funny. Thought funny. If I didn't monitor myself consciously, I walked like a chicken, hunched over and tentative, arms and legs drawn in close to my torso (and classmates often held contests to see who could best walk like me). But fantasy saved me. Every time things got bad, I just closed my eyes and floated away to Narnia, to Meg and Proginoskes, to Arthur and Merlin, to Bilbo and Frodo and Middle Earth (where I was a capable, brisk and beautiful female hobbit named Falin who knew exactly how to avoid trolls and navigate Mirkwood). Even better was the time I discovered Eowyn, and she became my mental avatar and avenging angel. And then I was okay. The real world was stickier. Despite my efforts, everything was noticed. And until I reached the eighth grade and had learned some social skills Bull himself (and the Ben-Hassrath) would have valued, I honestly thought school was supposed to be as hellish as it was. In fact, I was so constantly thrown down stairs, knocked down, shoved in lockers, punched, hit, mocked, pissed on, and constantly abused in seventh grade that my principal apologized to me almost weekly, calling me into his office personally on an ongoing basis to apologize. Then I'd thank him, shrug, try to get through the rest of the day, and go home to read Tolkien or Poe in my bedroom while listening to ABBA (a strange yet potent combination). The good news is, while I was learning how to get along, I had my books. I had my music. I knew the value of dreams. In fact, until I was 11 or so, I'd actually kept a backpack packed deep within the recesses of my closet, positive I was another Jill Pole, in preparation for the certain day when Gandalf would ultimately rap on my door and tell me my destiny (which of course he would). And then, see, I knew... I knew I'd panic, yet still I'd hastily throw together my backpack and hooded cloak (you have to have one if you're going adventuring), and I'd follow him out and away, jumping over the low place in the hedge and chasing the magical destiny that I knew had always awaited me. I think the secret power of being a nerd is... like Quentin Coldwater in Lev Grossman's The Magicians, you never quite outgrow that belief in magic. You're always looking for the glitch, the subtext, the secret that will take you away. It's there. It has to be there. And even when the trick is revealed, and you're told, over and over again, "No, it's just a book/game/film," you still privately always believe it exists. Even when the world has hammered it out of you (or so it thinks). Just ask Quentin. Me, I still believed. At 20. At 30. At 40. And, ahem, beyond... So when Gandalf didn't show up, I waited. Wrote my own stories. Consoled myself with games, TV, movies, and all the fiction I could wallow in. But I was still waiting. Then I played LOTRO (the lovely and lore-rich MMORPG of The Lord of the Rings Online), and later on, the Mass Effect and Dragon Age series (and most especially Dragon Age: Inquisition) and that's where the miracle happened. Time somehow unspooled and ran backwards. I was whole again, magical and hopeful. I remembered my secret wonderful hidden old hobbity/dwarfly backpack. And in a flash, I knew that long-ago backpack had been dark green in color. And that there had been a rough spot on the lower left-hand side. That I had stuffed it with random household foods that wouldn't be missed for the trip (from apple-pie filling to Cheetos). Everything flooded back in a moment of pure, visceral flashback. 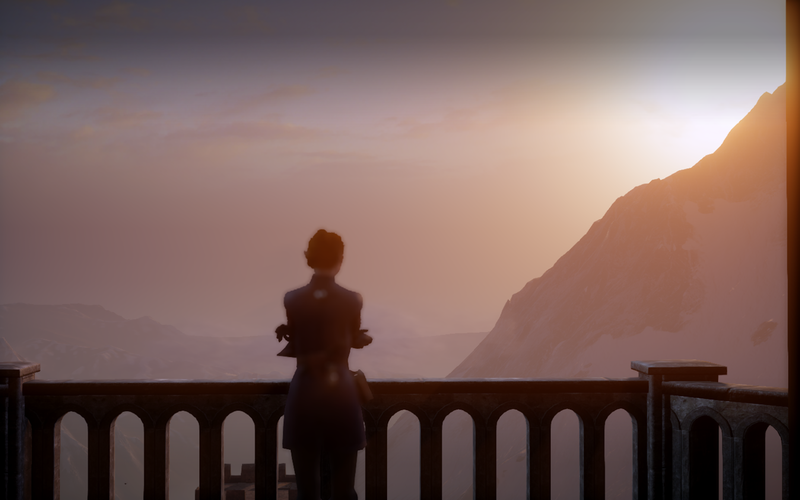 In other words, playing Dragon Age: Inquisition was the first time in my life I ever felt like, "Wait... I think I've actually found the magic wardrobe. Even if I don't quite get to go there." It wasn't just an escape. It enabled me to write a story and then enact its outcome, to create a hero or heroine that lived and breathed there, who fell in love, who lived and even (potentially) died. From there, I also found all sorts of wonderful discussion groups and boards, filled with people who were equally passionate about the world of Thedas, and who saw nothing odd in arguing about the hidden meanings of the quest "The Demands of the Qun," for instance, for hours at a time. I'd experienced this before, of course, to some degree, most especially with friends who were fellow Tolkien fans. But this went beyond that, in an odd and intense way. Because games are present-tense and of the moment, and because the DA fandom is almost always involved in a replay of some part of the trilogy, there's a part of you that's wherever you are in the game. You're out in the real world, doing real-world things, but somewhere, beyond the eluvian, your Hawke is attempting to make peace between the mages and the templars. Or your Warden's trying to decide whether or not to do the Dark Ritual. Or your Inquisitor is trying to get the hang of her spooky new ability to shoot green flame from her hand. Your hero or heroine is always out there, simply waiting for you to continue the adventure. Thanks to Dragon Age, the low place in the hedge was right there in the computer. And it was real. A single RPG game had reminded me of the magic, reminded me of the little kid I'd been, the one who'd dreamed of adventures with Bilbo and who'd kept that backpack in her closet, ready and waiting for the knock at the green door. Gods, THIS. All of THIS. I'm right there with you.